Home > Live Jazz Shows > The Venue Lounge Hosting "Jazzy Tuesday's"
The Venue Lounge Hosting "Jazzy Tuesday's"
Since opening last year, the Venue Lounge has been supporting a wide array of local jazz talent here in Columbus. While they mix in a number of other genre throughout the week, the Venue Lounge has been supportive of our live jazz scene here and is now offering a weekly “Jazzy Tuesday’s” each Tuesday night. For just a $3 cover jazz fans can stop in each week to here some excellent local live jazz. Shows start early so jazz fans can swing up early and make it home early for work the next day. This Tuesday, May 10th features the Vernon Hairston Trio. Other performers this month include jazz pianist, Kim Pensyl, and Jazz Patrol with Sabrina Tutstone. 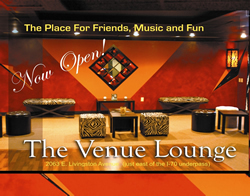 The Venue Lounge is located at 2063 E. Livingston Ave in Columbus. You can check out other performers and performances coming up by checking out their website: www.myvenuelounge.com. Let’s help continue to support this new local venue that continues to support our local jazz scene.